Decode various modes of non-voice radio communications. Is there a better alternative to MultiMode Cocoa? Is MultiMode Cocoa really the best app in Audio category? Will MultiMode Cocoa work good on macOS 10.13.4? 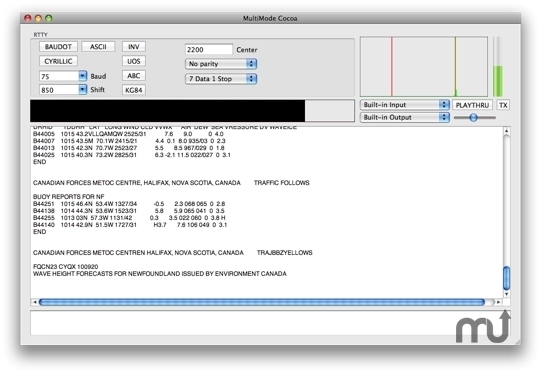 MultiMode Cocoa allows your Mac to decode and transmit several different modes of non-voice communication often heard on shortwave and ham radio. It is the only program of its kind for the Mac, rivaling commercial packages for the PC platform costing hundreds of dollars. It is ideal for amateur radio operators, shortwave radio listeners, and other radio enthusiasts.